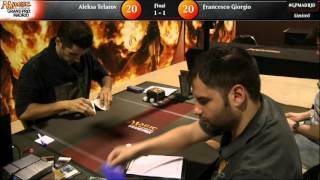 Aleksa Telarov flew to victory at Grand Prix Madrid 2015, defeating Francesco Giorgio in the finals of the final premier event to feature Magic Origins in Limited. It was a great weekend full of Magic and full of Magic Origins in particular. Grand Prix Madrid was the final premier event to feature the set in Limited, but the format proved as exciting as ever. One of the biggest stories of the weekend was Fabrizio Anteri's 15-0 run in the Swiss rounds. 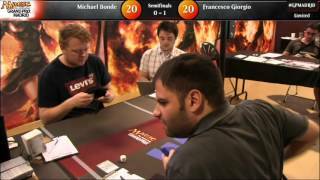 He was joined in the Top 8 by a number of other highly accomplished players, among them Pro Tour Fate Reforged champion Antonio Del Moral León and Wenzel Krautmann who made his fifth Grand Prix Top 8 here. In the end, however, it was Serbian Aleksa Telarov who turned his second Grand Prix Top 8 into a win. Having drafted a blue-green deck, Telarov defied all who had said bad things about the color combination. His flying creatures won match after match, up to and eventually including the finals against Francesco Giorgio. Congratulations to Aleksa Telarov, champion of Grand Prix Madrid 2015! Welcome back to Day 2 of Grand Prix Madrid 2015! After yesterday's nine rounds of Sealed Deck play the original field of 1,420 was reduced to a mere 165, who would now fight through six more rounds for a shot at the Top 8. One of the biggest stories of the weekend so far had been Fabrizio Anteri's 9-0 run. This marked the third time in three consecutive Grand Prix events that Anteri had remained undefeated on the first day, always with Hangarback Walker in both Standard and Sealed, eventually finishing the two previous tournaments in first and 13th place. Day 1 of Grand Prix Madrid 2015 is in the books! 1,420 players had entered the tournament originally, but through nine grueling rounds of Magic Origins Sealed Deck play that number was reduced to a mere 165. Those 165 would return on Sunday for two Magic Origins Booster Drafts and a chance at the Top 8. Overnight, five players stood tall at the top of the standings with perfect records of 9-0: Fabrizio Anteri (yet again), Antonio Del Moral León, Paul Schiefer, Kevin Pelaez, and Johannes Neumann. But fierce competition wasn't far behind, with big names like Carlos Moral, Lukas Blohon, Andrea Mengucci, Pierre Sommen, Jérémy Dezani, and Andre Coimbra all making the cut on 8-1 and a host of others narrowly squeezing into Day 2 on 7-2. With this setup, Day 2 would certainly prove interesting. 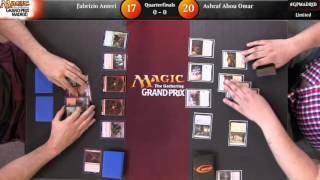 Join us then, when we delve into Draft, when we close in on the Top 8 and the epic conclusion of Grand Prix Madrid 2015!